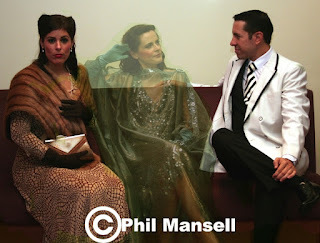 Recently I had the pleasant job of photographing members of the cast of Newport Playgoers' production of Noel Coward's supernatural comedy 'Blithe Spirit'. The play is about a man who, for a dinner party amusement, arranges for a medium to come and hold a seance - which conjures up the ghost of his first, mischievous wife, Elvira. Only he can see and communicate with her - much to to the consternation of his present wife. I thought it would be good to use Photoshop to actually create a ghostly image of Elvira and these are the results, achieved by taking two photographs and overlap them using layers, then adjusting the opacity and adding a slightly green filter to give a spooky effect. These are the results. Next project is to make a video trailer for YouTube in which a see-through Elvira talks about the play - and hopefully entices people to come along and see what promises to be a truly haunting production. Noel Coward’s sophisticated comedy ‘Blithe Spirit’ is at the Dolman Theatre from Wednesday 12th – Saturday 15th September at 7.15 pm, with an extra matinee performance on the Saturday at 2.30 pm. To book tickets call 01633 263670 or visit www.dolmantheatre.co.uk. More information is available online at www.newportplaygoers.wordpress.com. New members are always welcome to become involved both onstage and behind the scenes!